My mom is recovering from major surgery here at our home. She spent the first couple of weeks in a hospital and rehab facility, where the food was…truly awful. I brought her little farmer’s market treats like sliced tomatoes and strawberries, to remind her that not all food comes from boxes and cans, but man, the overall effect of feeding healing people crap food is seriously depressing. She is glad to be here now, noshing what appeals from my endless stream of cooking, and starting to cook for herself again too. She can’t eat more than a few bites of anything at a time – and all she’s truly hungry for is sweets, ha – but she made herself a killer BLT yesterday, thick with a perfect tomato and a pile of freshly picked lettuce, and managed to eat half of it. Baby steps on the road to recovery. She also managed a few bites of this soup, which really hit the spot on a cool, fall day. 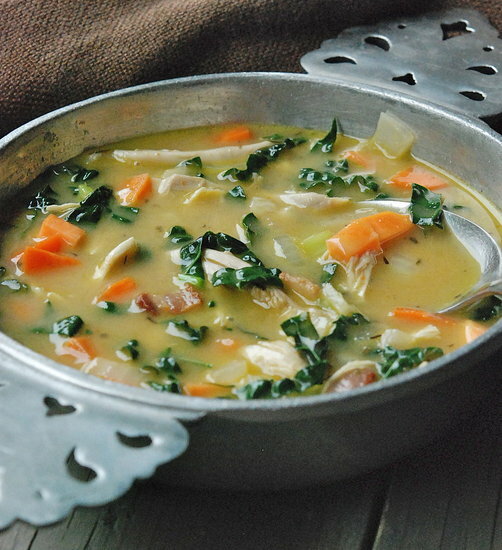 I love chicken soup for its endless versatility, and of course for its soothing, healing deliciousness. I studded this version with kale, sweet potatoes, garlic, and just a spot of bacon because my mom loves bacon. I am of her, after all. This is a nice transitional soup, warm on a cool day, but full of end-of-summer bounty like a garden-ripe tomato. A hint of nutmeg is lovely here, as is a shower of freshly grated Parmesan to finish. Heat a Dutch oven or casserole with a tight fitting lid over medium high heat. Add the bacon fat or oil and when hot, add the chicken and brown it thoroughly all over. Remove chicken to a plate and set aside. Bake (or simmer) chicken for 1 1/2 hours, or until chicken is very tender. Remove chicken from the pot to a cutting board (it might break apart into pieces, which is fine) and let cool for a bit. Strain stock through a colander into a large bowl. Skim fat from stock. Discard strained vegetables. Set the Dutch oven over medium heat and add the bacon to the pan. When the bacon is browned and crisp, add the diced onion, diced garlic, diced celery, diced carrot, kale, sweet potato, and nutmeg. Saute for about 10 minutes, stirring a few times, until the onion is softened. Pour in the stock and simmer, uncovered, for 10 minutes or until the carrot and sweet potato are tender. While the soup simmers, tear the chicken into bite-sized pieces, discarding the skin and bones. To serve, stir about half of the chicken into the hot soup (reserving the rest for another use) and taste for salt, adding more if necessary. Divide the diced tomato among soup bowls, ladle soup over the tomatoes, top with black pepper and Parmesan cheese, and serve. Haha, fabulous. Enjoy! And thank you - Happy New Year! Making this for a little post-holiday detox (yes, detox involves bacon). Thanks for the great recipe! I've made this soup twice and invited friends over both times. Now my friends are asking for it all the time. Wonderful recipe! Made this for a baby shower... ZOMG!!!! Amazing!!! Lovely recipe. There is nothing I know that warms you more than a big bowl of warm soup. Here's one you might like to try. I just made this soup tonite. Wow! It was fantastic. My 20 year old son and his friend loved it. I plan on passing this one on to my friends. Thanks. Thanks fuzzles, I hope you enjoy! And my mom is feeling better and better all the time, thank you for that too. Shimrit - good catch! I had forgotten to add the quantity! Thank you, I've added it now, and thank you for bookmarking my blog, lovely of you. That looks and sounds sooo nummy! I'm going to have to whip up a pot this weekend, both to enjoy now and freeze for later. Hope your mom feels better soon! I believe you could use pork! The result would be different, richer, but lovely. can I substitute Pork for the chicken in a pinch if you don't have chicken? Would I need to do anything different besides making the stock (thought I'd use better than bullion) This is just in case I don't have the time or availability of all the required ingredients. Aren't you sweet Katie? What a nice thing to say, I so appreciate it. Everything you make always looks fab, and so gourmet! Thank you Heather! I'll put this on Stuffed Pepper (after I get back from CA, I swear), it's a winner. Thank you also to the gracious Anonymous post above - I'm so glad! And also Lauren - I'm so grateful for the kind wishes for my mom, you are all so lovely. She really appreciates it. We have "soup and salad" night once a week in our house and I love to make soups from scratch. This one looks so hearty, healthy and delicious, all at the same time! I can't wait to make it. I wish your mother a speedy recovery. She's in good hands. Just make it....and wow..... deliciousness.....! This looks delicious! Perfect for the cooler weather we've been enjoying here. Best of luck to you and your mother--I hope her recovery process goes smoothly. Hahaha. Yes, also bacon. I'm all about primal in my day-to-day life. I still include recipes with grains, but not often, and if I do, I try to include grain-free adaptations. So I hope you find things to try! Good luck with your new lifestyle! For me...changed my life. All GOOD. This looks amazing - I just started eating primal and this is perfect. Also, bacon. Thank you! I hope you enjoy it. 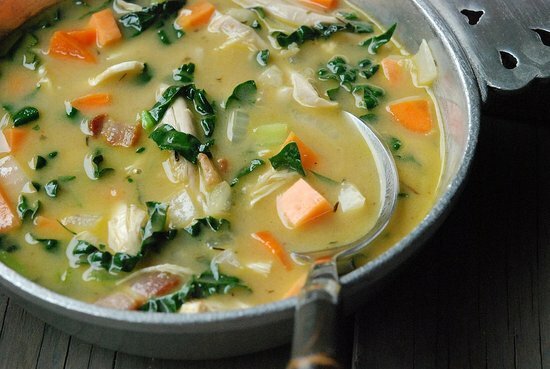 The first warm soups of the season are always so cozy. This looks so delicious and perfect for Fall - will definitely be trying this recipe!